The Swannanoa Community Yard Sale is back, and the time for seller registration has arrived! The fall yard sale will take place Saturday, October 6, from 8 a.m. – 1 p.m., in the Swannanoa Ingles Parking Lot, 2299 U.S. Highway 70. This popular twice-annual event attracts dozens of sellers and hundreds of buyers. There’s something for everyone! 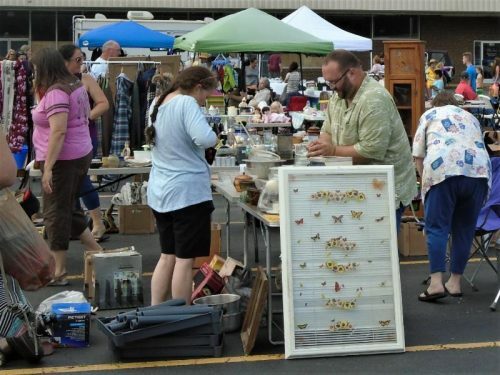 If you’d like to register for a space (or two or three) to sell your treasures, please call 828-581-9707 OR email SwannanoaYardSale@gmail.com with your name, phone number and the number of spaces you’d like to reserve. The cost for each space (approx. 10′ x 15′) is $10; bring your own tables. To streamline the registration process, payment for reserved spaces must be made in cash when you check in on the morning of the sale. The yard sale takes place rain or shine, so you may want to bring a tarp or pop-up tent to keep items covered in case of a shower. The Swannanoa Community Yard Sale is sponsored by Friends and Neighbors of Swannanoa (FANS), www.SwannanoaFANS.org. Proceeds from the rental of seller spaces help to fund FANS’ work in the Swannanoa community.